Bournemouth Borough Council: Darryl Howells has secured a householder planning permission to carry out alterations and construction of a new roof with dormer windows and a rooflight to form first floor level accommodation above a bungalow. Prior to Pure Town Planning’s involvement as the client’s planning consultant, the applicant had sought consent for a similar proposal which was refused by Bournemouth Borough Council, then subsequently dismissed on appeal by the Planning Inspectorate. The Inspector concluded that the scheme before him would “in this context it would represent an incongruous feature in the street scene which would fail to respect it setting. Not only the ridge line be significantly higher but the raising of the eaves would add to the incongruity. I also consider that the building would end up with a top-heavy appearance and that the development presents an excessive increase in the height and massing of what is a modest bungalow”. Following the dismissal, the client engaged the services of Pure Town Planning to advise on a scheme that would be acceptable in policy terms and would overcome the concerns of the previous Planning Inspector. Using Darryl’s expertise and advice, the client instructed the plan drawing services of Design & Development Associates Ltd. The planning application was prepared by Darryl, with the firm’s usual supportive and convincing planning statement that justified the scheme in planning and policy terms. During the course of the consideration of the scheme, the planning officer reverted back to the Planning Inspector’s decision and advised that no first floor extension or alteration would be permissible as the Secretary of State had indicated. 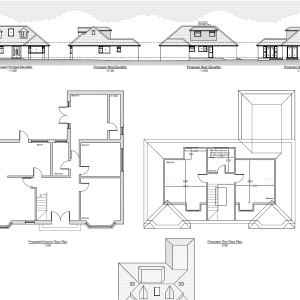 Darryl undertook a review of several high-profile conversions of bungalows to chalet bungalows that had occurred locally and again drew comparisons between the approved schemes and the client’s proposals, finally arguing inconsistencies of the Council’s decisions. In conclusion the Local Planning Authority accepted the arguments that Darryl put forward and a negotiated solution was agreed and approved. If you have received a dismissal of your planning appeal from a Planning Inspector, it does not automatically result in future applications for similar developments being refused. If you find yourself in this situation, call Pure Town Planning and allow us to advise you how to overcome the Inspector’s reasons for dismissal, and to try to secure your planning permission.